Baked doughnuts - or donuts, if you prefer the shorter spelling - are surprisingly easy to mix and bake. There's no need for an electric mixer and preparation takes about 5 minutes. Not to mention the fact that, since they aren't deep-fried, they are lighter in fat and absolutely delicious. The texture is cake-like, yet fluffy, and the topping can range from a simple coating of sifted powdered sugar to a more complex glaze or icing. All you need to make these yummy baked doughnuts is a 6-well doughnut pan. 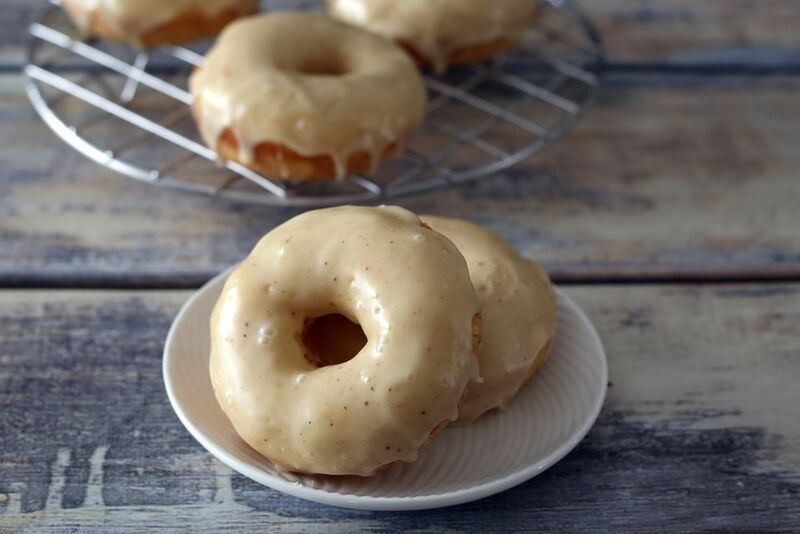 These eggnog baked doughnuts are ideal for the holidays. Serve them as a dessert with coffee or spiced cider, or bake them for a holiday morning. The simple batter for the doughnuts includes eggnog, vanilla extract and nutmeg. The glaze is a simple mixture of powdered sugar and eggnog. Feel free to use rum flavoring instead of vanilla in the doughnuts, or replace 2 tablespoons of the eggnog with rum. Feel free to decorate the icing for the holidays. Use red and green candies or sugars, or double the icing mixture and color some of it with red and green food coloring. Drizzle the festive colors over the plain eggnog glaze. The batter for the doughnuts should be fairly thick, but not so thick that it is doughy. You can either pipe it into the doughnut pan or spoon it in. Make sure the pan is buttered or sprayed with nonstick cooking spray. Use a neutral flavor oil, such as coconut oil, safflower or sunflower oil. Grease a 6-well doughnut pan or spray it with nonstick cooking spray. In a medium bowl, combine the flour, baking powder, 1/4 teaspoon of nutmeg, and the salt. Whisk or stir to blend thoroughly. In a mixing bowl, whisk the 2/3 cup of eggnog with the egg, vegetable oil, granulated sugar, and 1 teaspoon of vanilla extract. Add the flour mixture and stir until well blended. Spoon the batter into the wells of the doughnut pan, filling them about two-thirds full. Alternatively, to pipe the batter, spoon it into a plastic food storage bag and cut out a small piece of the corner. Squeezing the bag, pipe the batter into the wells. Bake the doughnuts for about 9 to 11 minutes, or until set. A toothpick inserted into a doughnut should come out clean. Let the doughnuts cool in the pan for about 10 minutes, then turn them out onto a rack. Sift the powdered sugar into a bowl. Add 2 tablespoons of eggnog, 1/2 teaspoon of vanilla, and a dash of nutmeg. Stir until well blended. If the batter seems too thick, thin it with more eggnog or some milk. Dunk the tops of the doughnuts into the glaze and place them back on the rack to dry. The glaze would soak into the more porous bottoms, so the tops are best for glazing. Store the doughnuts in air-tight containers or zip-close storage bags in a cool, dry place for up to 2 days at room temperature. Freeze the unglazed doughnuts for up to 3 months. Thaw them at room temperature and glaze them about 2 hours before serving time.